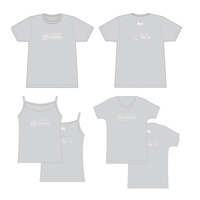 In 2007 12k started a series of t-shirts in which prominent designers in the electronic music community were invited to remix the 12k logo onto a shirt design. The first design came from Ireland’s Fehler, the design team behind Fällt, who capitalized on the negative space in the 12k logo to create a shirt of abstract simplicity. Summer 2008 brought two new designs by Swiss artist Steinbrüchel. Each shirt features a design created from the mapping of vector and intersection points across the 12k logo. With SHIRT01 Steinbrüchel has made a horizontal line through every intersection and vector thus reducing the 12k logo into a series of thin horizontal lines. The process from original logo to final design is documented in the following pages. SHIRT01 is printed in white ink on both sides of a “silver” (light grey) American Apparel shirt and is available in S, M, L, XL, as well as Babydoll and Spaghetti Strap style.